Vegetarian and vegan food! For eating! My name is Ellen, and I love soy. Soy everything. Will it give me cancer? Probably not. But even if it did, I love soy. So I wanted to eat edamame. And I wanted to make a salad out of it. I actually thought of making this to take to my family’s Memorial Day barbecue, but I skipped that for selfish reasons. Oops! So I made it just for me instead. It’s a really simple salad, but if you like sweet and savory this is totally awesome. And I love sweet and savory. 1 apple, cored and sliced or chopped or whatever. peeled if you like. i didn’t! Cook the edamame however the package says to cook it. Drain and rinse it with cold water to cool it off and dump into a bowl. Add the rest of the ingredients and mix it all up! 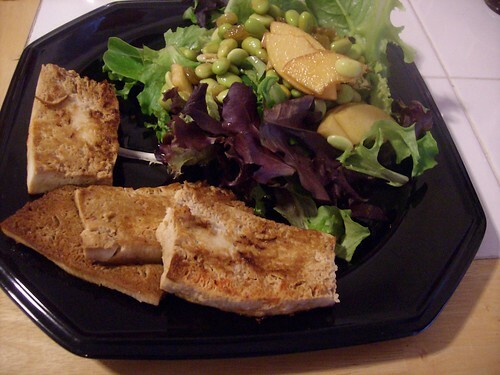 I ate it over baby lettuce and had some tofu slices that I cooked up with it. Leftovers were good for lunch. Good and simple and summery! Yum! I always wonder what to do with edamame other than just eating it alone. I’m a fan of foods with protein+fiber, and this looks much tastier than what I usually come up with.